Children and their moms participating in a "Little Lunas" developmental class at the Over the Moon Parenting center in Norwell. It was one of the scariest things I had ever done, but it was a step I had to take. I was a few months pregnant in fall 2015, and hadn’t lived in Massachusetts long. Feeling excited about impending motherhood, but also overwhelmed and isolated, I looked online for groups of pregnant women I could join. The thought of complete strangers meeting in a coffee shop — in search of support, and maybe even friendship — seemed terrifying, but I was craving community. For years, I had approached people on the street as a reporter, but seeking a personal connection in such an unstructured setting felt completely different. I found the group on Meetup, a website that connects people with similar interests, and it was just starting in Downtown Crossing. I learned later that there are many other ways for new moms to find each other, from library story hours to baby art classes to Facebook groups. But Meetup was where I started. The first meeting was a little awkward — nearly no one knew each other, and the only apparent thing we had in common was being pregnant. But we soon learned that though we were scattered in and around Boston, many of us were new to the area and far from family and friends, or were in the midst of leaving the city for the suburbs. A lot of us were also dealing with career changes brought on by our recent moves or motherhood. I went for a few weeks knowing it was something I should do, but soon looked forward to seeing familiar faces. We spared our friends and family the details of doctor visits and birthing plans, but were anxious to share this minutiae with each other. The first year of motherhood can be difficult in any situation. Throw in distance from a support network, job changes, learning to navigate a new city or even find a baby sitter without a trusted referral, and the transition can be overwhelming. Professionals who work with new moms say that connecting with other women making the same adjustment is important. I soon found that the weekly treks downtown from my home in Quincy weren’t practical once the baby arrived. When my baby was 3 weeks old, I started attending a new-moms class in Norwell. “I feel like people who understand new mothers are other new mothers,” said Margaret Breen, who has a nursing background and taught the class. Breen’s focus during our sessions was on care of the mother and the baby, though Over the Moon Parenting, which is her business, offers many different classes for children and caregivers. While discussion is encouraged, the newborn class is structured so that if a mom doesn’t feel like talking, that’s OK.
She encourages each newborn class to form a private Facebook group and meet for lunch on class days to deepen their relationships. Having support from other moms outside of class is important, she said, even if everyone in the group isn’t best friends with everyone else. In addition to community, structured settings such as a class or support group can provide moms with new ways to care for their babies, giving them more confidence. Teresa Coelho teaches Music Together classes in Salem, Beverly, Marblehead, and Rockport, and she says music can help moms soothe their babies or establish a routine at home, or help with transitions to other settings while traveling. In Newton, a free support group for mothers of babies is offered at the Freedman Center at William James College. 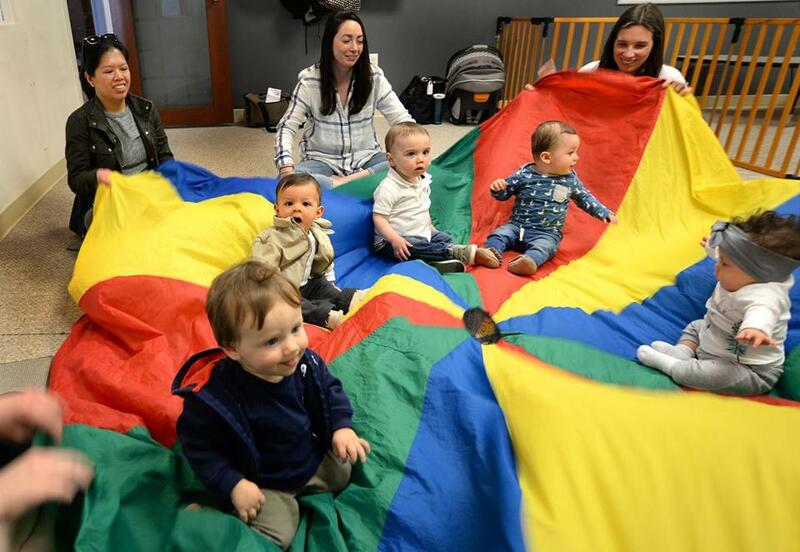 The six-week sessions are capped at 12 people, and discussions are balanced between what is going on with the babies and with the moms, said Nadja Reilly, a psychologist who leads the group. Freedman Center staff can also connect moms experiencing postpartum depression or anxiety with mental health providers. Kelly Rosofsky of Newton, who stays home with her 1-year-old, said she doesn’t consider herself particularly outgoing, but actively looked for places to connect with other moms. She found the Freedman Center groups to be open and accepting. 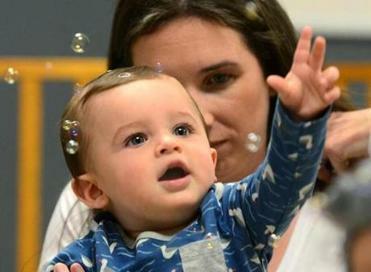 Jen Schiffman, who lives in Stoughton and works full time in Boston, found that her baby’s unexpected stay in the neonatal intensive care unit, or NICU, last year led to some unexpected difficulties early on, including postpartum anxiety. She benefitted from two programs offered by Jewish Family & Children’s Service, in which a local mom and a social worker visited Schiffman’s home and talked about motherhood, helped Schiffman understand her daughter’s expressions, and helped her think about ways to address her anxiety. She also found a supportive community in Boston NICU Mamas Unite, a Facebook group. Jill Terreri Ramos can be reached at jill.ramos@globe.com. Follow her on Twitter @jillterreri.